The development of this set of designs was centred around an attempt to make a limited number of tiles produce a complex tessellating pattern; a tile design which would allow a wide degree of individual freedom when put together as a whole schema. 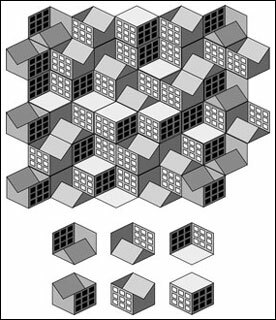 A basic hexagonal tessellation was adapted to produce a set of three tiles which can be employed in either orientation to produce simple house forms with roofs which are either pitched, valley or flat. 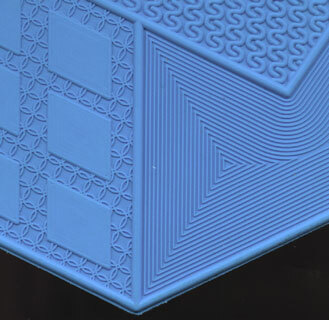 These tessellating house tiles were produced as part of a research project which aimed to demonstrate the potential of digital technologies to enable ceramic designers to develop innovative aesthetic qualities in low relief. 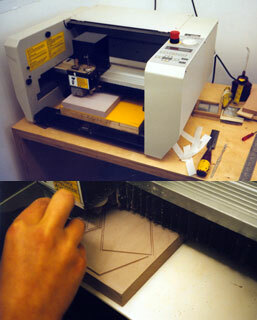 The tile designs were developed using Abode Illustrator and then imported into software which created tool paths which controlled the cutting of moulds by a desktop CNC (computer numerically controlled) milling machine. The use of this technology facilitated the production of highly detailed designs which would have been impossible to produce in any other way, so extending the creative practice of the maker. Silicon rubber masters were taken from the milled moulds and these were used to produce the production ram press moulds. The tiles were pressed in white stoneware and glazed using a transparent low solubility glaze with added colour. 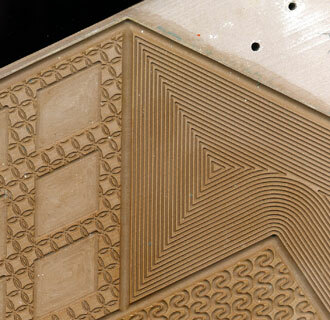 The pooling of the coloured glaze into the low relief design was intended to produce a surface pattern embedded within the body of the tile rather than printed onto the surface. This work was produced as part of a collaborative project with Dr Katie Bunnell, Reader in Design Research at Falmouth College of Arts and was funded by the Arts and Humanities Research Board. I would also like to thank Tavs Jorgensen and Dartington Pottery for their help and support.